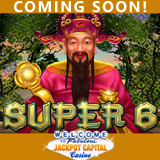 Next week Jackpot Capital Casino will launch Super 6, a unique new six reel slot game from RTG. Meanwhile, the $90,000 Superhero Club casino bonuses event rewarding frequent players with weekly bonuses up to $500 each continues until Sunday. Super 6, a hot new Asian-themed game from Real Time Gaming, features six reels of glittering symbols paying All Ways from left to right and right to left. Grouped Wilds double any prize they appear in. Scatters trigger free spins and features triggered with scatters all on the same row award even bigger bonuses like Mega Grouped Wilds, 5X prize multipliers and an additional Wild symbol. Pre-launch casino bonus now available. Valid only until May 18th when further bonuses will be announced. Players earn reward points when they play games at Jackpot Capital and receive weekly bonuses based on their points score. The current $90K Superhero Club event will reward top scoring players with weekly bonuses up to $500 each until May 15, 2016. Contest details and current Scoreboard rankings are available at: http://promotions.jackpotcapital.eu/superheroclub. An $85,000 casino bonus giveaway will begin the following day. Jackpot Capital Casino offers hundreds of slots and table games from Realtime Gaming (RTG) in its download and instant play casinos. The most popular games, including the new Super 6, are available in the mobile casino for smartphones and tablets.